Sources: Mac Owen, Rex Brittenham, Charles Ryland and more. 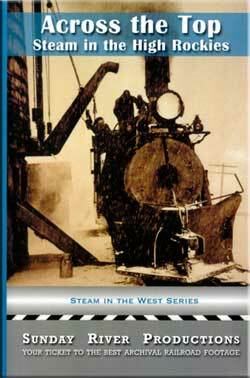 Steam in the West Series. A focused program of high altitude steam railroading. Surprisingly, is the variation within the scope of that format. Alva has assembled a collection of: ultra rare, short films on Colorado railroads. They are from different years. The sources are; black & white and color film. The under one hour running time packs in ,so much railroading, it takes more than one viewing to take it all in. Loaded with mountainous steam trains, this one satisfies the thirst, for vintage Colorado steam railroading. Both, narrow and standard gauge lines are visited. As I discussed in Steam On Horseshoe Curve, Alva is an original master of the train video. A couple of his movie shorts in this show, were originally on reel film. South Park is one. The invention of the vhs tape and home vcr players changed the marketplace. Alva issued feature-length video tapes. Easily spotted, the shorts have their own titles, credits and lettering variations. As they shows have aged, they too become a part of the lore of railroading. In the age of the DVD, we now enjoy enhanced films. This program was recently digitally remastered. While it isn’t fair to compare 1930 footage to 1980, everything appears clean. Audio sounds are outstanding on the DVD. The natural train sounds will jump right out. Crystal clear when they are present. Some rather whimsical music theme ties everything together. Not my cup of tea, but much better than some other producers have used. We are here for the trains anyway. This show has great trains! A few highlights, from a program of mostly all highlights. The 1930’s begins with a look at The Panoramic. An ancestor of the California Zephyr, it featured Pullman service. Early 3400 class Mallets are present. A brief segment. Colorado Central and South Park follows. A quality map depicts the area we are to visit. South Park will continue to have a key role in this program. Alva’s continued historical information, adds to the pleasure of these films. The South Park Line is fascinating. Some spectacular views of a narrow gauge train, in snow, chugging up a mountainside! South Platte Canyon has rare film of double-headed and quadruple-headed,steam in cold weather! Pusher/ helper steam locomotives are the icing on this cake! Amazing sequence in the narrow canyon. The 1940’s turns into full color. Behemoth, 3700 class, 4-8-8-4, articulated Mallets are an awesome sight! Updated equipment is compared to earlier 1930’s versions of named passenger trains.Even some of the names were changed at the time.The upgraded Mallets are the centerpiece here. Nicely done! Ride The San Juan is a color chapter. Travel through Cumbres at over 10,000 Feet! The arrival at Chama shows a working Rio Grande yard, that one still exists albeit a tourist line now. The train arrives at Durango and a busy yard there. Switching moves assemble a mixed train for Silverton. The freight/ passenger train is filmed as it departs the yard. Marshall Pass and The Gunnison by Charles Ryland in color. Begins at Salida yard. Unique, is the ‘gimmick’ of having a conductor punch our ticket at each station, as we traverse this high line. Featured, is a narrow gauge excursion by The Rocky Mountain Railroad Club. Very scenic and high viewpoints from a passenger car. Marshall Pass station at an elevation of 10,856 feet is seen! Arrival at Gunnison, and time travel to black & white film 1930’s comparison. The conductor punches our ticket, to further the journey. More spectacular scenery! This Gunnison Line is now completely submerged, along with the gorge. This was due to a dam being constructed, and a resulting lake. Currecanti Needle is displayed. Alva explains how this was used for the mountain peak in the Rio Grande logo. Amazing scenery! Climbing to Climax, as filmed by Mac Owen. Burlington Route steam on the Colorado & Southern, with standard gauge railroading. Leadville to Climax line, was widened from narrow gauge trackage. We follow C&S #641 steam engine as it climbs uphill with a short freight train. At Climax, the 641 switches some boxcars, and reassembles the train. A highly enjoyable and informative program. Alva Morrison had excellent production skills. Across The Top: Steam in the High Rockies, is exceptionally fine. There are numerous train videos about Colorado narrow gauge steam. This rare, vintage film based program, featuring the high lines, is the best one that I have seen. This entry was posted in ATVR Reviews, Steam Train Reviews, Sunday River Productions and tagged American Train Video Reviews, Burlington Route, Coal, narrow gauge, Railroad, Rio Grande, Steam, Steam engine, steam train, Train DVD, transportation by William J. Hudson. Bookmark the permalink.